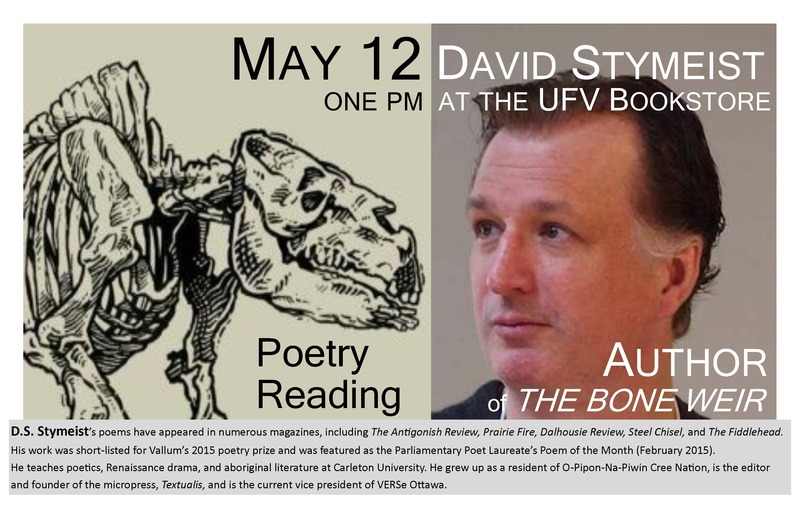 Join the English department at 1 pm on May 12 for a reading by David Stymeist, author of The Bone Weir. Coffee generously provided by the bookstore! D.S. 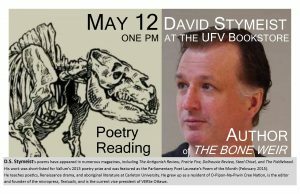 Stymeist’s poems have appeared in numerous magazines, including The Antigonish Review, Prairie Fire, Dalhousie Review, Steel Chisel, and The Fiddlehead. His work was short-listed for Vallum’s 2015 poetry prize and was featured as the Parliamentary Poet Laureate’s Poem of the Month (February 2015). He teaches poetics, Renaissance drama, and aboriginal literature at Carleton University. He grew up as a resident of O-Pipon-Na-Piwin Cree Nation, is the editor and founder of the micropress, Textualis, and is the current vice president of VERSe Ottawa.